Make an impression at your next gathering. Top off your decanter in elegant style with this serving essential. Crafted from solid eucalyptus. Designed for wine, whiskey or any large mouthed decanter. Does it fit well in the Vivid Decanter? BEST ANSWER: The Personalized Wood Decanter Stopper does fit into the Vivid Decanter. It does not sit up like in the photograph, it sits lower in the decanter. Can you send me a picture of it so I can have a better idea, I just want to avoid the hassle of returning both items if I don’t like the way it looks. I am planning to order it as a fathers a day gift for my husband. 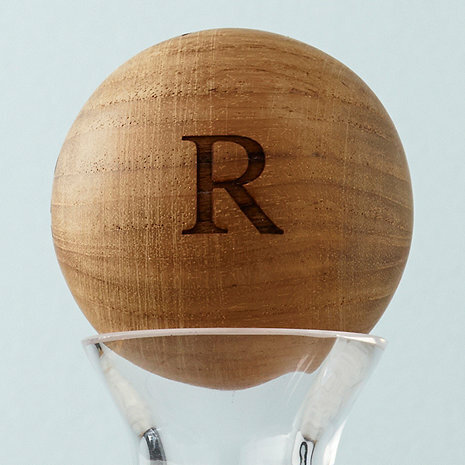 BEST ANSWER: The Personalized Wood Decanter Stopper weighs about 4 ounces. I never knew we needed this until I saw it online and then in person. We live in a warm climate and most times of year, we have little fruit flies that like to sip our wine. This will keep them out! Plus - it looks great to boot. The wood stopper is well made, and is a classy way to keep dust, dirt, etc. out of your decanter prior to use! I ordered this item as a Christmas gift for my Dad and I can't wait to give it to him! Very nice quality and the engraving turned out very nice as well! It Doesn't Fit the Decanter! It's pretty, but it does not serve as a stopper. It does fit the slanted top decanter I purchased it for- not even close. They should not be advertised together!